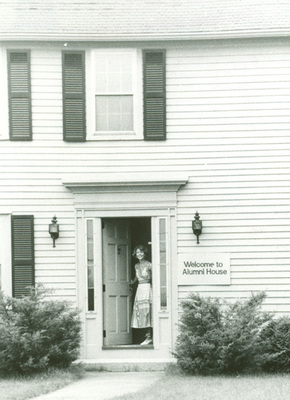 "Class of 1970 Gift -- Funds Towards the Establishment of an Alumni Cen"
The Captain Joseph Mowry House was renovated in the early 1970s and became Bryant's Alumni House. In a letter to Mr. Joseph Hagen from Mr. Kenneth Cedergren dated February 1, 1971 regarding an Alumni Center on Bryant's new Smithfield campus: "... In a letter to all the class on May 1970, the opportunity was presented to the Class of 1970 to establish a commemorative ...[monetary] gift to be used to provide an Alumni Center. The gift committee proposed a pledge of $.80 a week for the next five years... $10,000 was pledged ..."